You've jumped through the hoops and over the hurdles of establishing your business and you're ready to start making money. But before you can do so, you have one very important task left to complete-you must find and purchase inventory. Finding trusted and reputable wholesalers can be a daunting task in itself. Deciding whether you should purchase in bulk or dropship is an added stress that we hope to help eliminate. Let us explain. Historically, retailers would purchase inventory in bulk directly from a wholesale distributor. This method is referred to as stock and ship. Many retailers who are able to purchase in bulk do so as bulk orders are generally sold to retailers at a discounted price. Discounted bulk rates can provide the retailer with higher profit margins once their inventory has sold. Profit margins aside, there are certain downfalls to purchasing in bulk. Regardless of whether you operate out of a physical location or online, you will need a secure location to store the inventory. Warehousing and logistics are not cheap, so it is important to consider these costs prior to investing in bulk orders. In addition, it's important to remember that not all inventories are guaranteed to sell. Remember to review sales records and trends prior to placing an order. Otherwise, you run the risk of ending up with excess inventory, which you'll be forced to sell at a deeply discounted rate, potentially costing you money. Drop shipping is defined as an arrangement between a business and the manufacturer or distributor of a product the business wishes to sell in which the manufacturer or distributor-and not the business-ships the product to the business's customers. As an online retailer, you can save money on brick and mortar as well as inventory. Drop shipping can reduce your upfront costs significantly. You aren't required to purchase merchandise in bulk, secure warehousing or maintain staff for pack-and-ship. All upfront costs are relayed to the drop shipping company. Drop shipping affords retailers the opportunity to offer a more diverse product base than what might otherwise be feasible if the retailer had to stock everything. Imagine a small yoga studio that also sells apparel and equipment. The studio may have limited space for storing inventory, allowing them to sell a smaller number of items. But online, if the retailer has drop-shipping arrangements with various fitness apparel and equipment wholesalers, they have the ability to offer a wider variety of products. Many people turn to drop shipping with the misconception that they will receive the same wholesale pricing as everyone else. Wholesale distributors purchase merchandise in bulk crating from manufacturers, who in turn sell to retailers. It is more cost-effective for wholesale distributors to sell inventory via the stock and ship method opposed to individually as the cost of shipping is significantly lower. 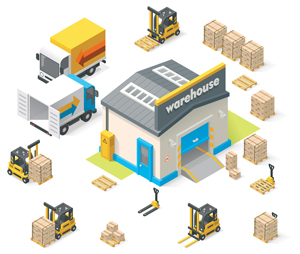 From the wholesaler's perspective, it is more economical to sell twenty items on a single pallet versus physically opening a pallet, piecing together smaller orders and shipping them separately. Depending on your target market and niche, you will most likely work with several wholesale distributors to offer your customers the most diverse selection of goods. It is important to keep in mind that each distributor will charge a shipping fee for fulfilling an order. You will need to charge higher shipping costs in order to break even. A 2011 survey found that forty-four percent of Web shoppers said they were less likely to complete online transactions because shipping and handling costs were too high. More customers opt for the cheapest shipping option instead. Although this may sound advantageous, it can also wreak havoc on customer experience. All distributors have different shipping times and ship from different locations. If your customer purchases two separate items from wholesalers A (based in New York) and B (based in Los Angeles), they will most likely receive two separate packages at differing times. Furthermore, what happens if an order doesn't arrive on time, or if an order doesn't arrive at all? You are the one who has to answer all of the questions and take the blame for the drop shipper's mistakes. When deciding whether you should purchase in bulk or dropship, you'll need to consider the amount of risk you're willing to take paired with the amount of money you're willing to spend. Purchasing in bulk has its risks; however, it affords the opportunity to increase profit margins while maintaining control over warehousing and logistics. Conversely, drop shipping provides business owners with lower upfront costs and eliminates the risks associated with purchasing in bulk.